Only in Louisiana - documenting the adventures we call Life! : A yummy treat! Back to this post ~ Ellen and I made the most awesome muffins and I want to share the recipe. They are Banana Chocolate Chip Muffins and they are some of the best muffins I have ever put in my mouth. Place these ingredients in blender (or Mr. Blendtec) and blend until pureed and consistency is smooth. 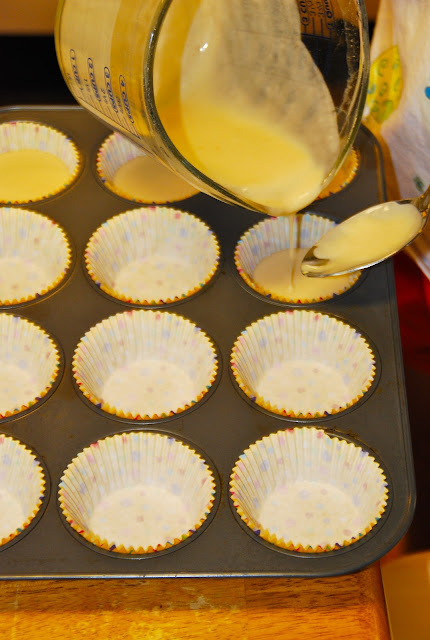 Pour into muffin tins - our goal was to pour the batter and not "spill on the sides" as cleaning muffin tins is not fun. Ellen came up with the idea of using a spoon to catch the drips while pouring as she moved from muffin to muffin. It worked! Add chocolate chips! We used a mixture of chocolate and white chocolate chips. Cook until golden brown. Double the batch as they go quickly. I am off to make a batch right now as soon as I press the publish button! Wow! These look yummy too! I left the bread pudding and the white hot chocolate recipes on separate comments following my post today. Get over there and do some cut/paste work. Thanks for the sweet compliment! You're my new bff because I'm doing some thinking this weekend about that blog of mine. Most days I go between wanting to hang it up so I can have more time to do my "real" work and digging in deeper to make it better. Today has been one of "those" days! I look forward to seeing more of your blog. I really do visit the blogs of people who visit mine. It helps me be in touch with what everyone else is writing about.